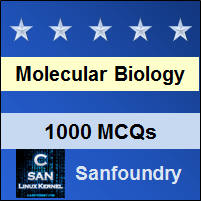 This set of Molecular Biology Multiple Choice Questions & Answers (MCQs) focuses on “Replicating Linear DNA in Eukaryotes”. 1. Replication of chromosome occurs during the____________ phase. Explanation: Replication of chromosome occurs during the S – phase of the cell cycle. During this time all the DNA is duplicated exactly once. Incomplete replication of any part causes inappropriate links between daughter chromosomes. 2. It is important to replicate the DNA correctly and only once. Explanation: During S – phase the DNA is duplicated exactly once. Incomplete replication of any part causes inappropriate links between daughter chromosomes. Segregation of this linked chromosome causes chromosome breaks or loss. Rereplication of DNA can also have severe consequences. 3. Selection of replicator occurs in ___________phase. Explanation: Replicator selection is the process of identifying sequences that will direct the initiation of replication and occurs in the G1 phase. This process leads to the assembly of a multiprotein complex at each replicator in the genome. 4. Activation of the origin of replication occurs in ____________ phase. Explanation: Origin activation only occurs after the cell enters the S phase. This triggers the replicator – associated protein complex to initiate DNA unwinding and DNA polymerase recruitment. Explanation: The replicator selection is mediated by the formation of pre – replicative complex. It comprises of four separate proteins assembled together. The four parts are the eukaryotic initiator, ORC which recognizes and binds to the replicator sequence of the DNA. This further facilitates the binding of 2 helicase loading proteins and finally a helicase. 6. The pre – RCs are auto – activated as soon as the cell enters the S – phase . Explanation: The pre – RCs are activated by two protein kinases. Protein kinases are those enzymes which covalently attaches phosphate groups to target enzymes to activate them. 7. Which of the following is wrong about the cyclin dependent kinases? Explanation: Cyclin dependent kinases play 2 strongly contradictory roles in regulating pre – RC function. First they activate the pre – RC complex to initiate DNA replication. Cdk activity also inhibits formation of new pre – RCs. 8. Active cyclin dependent kinase is absent in ____________phase. Explanation: Active Cdk is absent during G1, where as elevated levels of Cdk are present during the remainder of the cell cycle. Thus, during each cycle there is only one opportunity for pre – RCs to form and to be activated.